How Many Banks Offer Investment Services? According to FDIC Call Report data, 1,656 U.S. retail banks report investment fee income. But that total is down 29 percent since 2007. 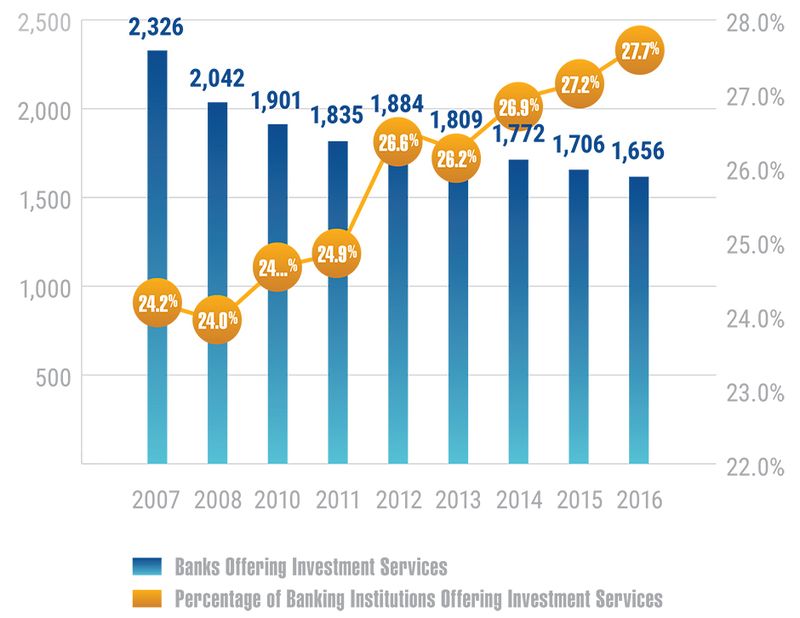 Nonetheless, the share of retail banks selling investments has crept up from 24 percent to almost 28 percent over the same period, because consolidation of the banking industry has shrunk the number of U.S. banks from 9,630 in 2007 to less than 6,000 today. What does that mean for the number of bank customers who can now invest where they bank? Find the answer in the Kehrer Bielan 2016/2017 Annual Industry Checkup sponsored by BISA. Full results are available to BISA members only. For information on how to download the full report, or more information on joining BISA, please contact BISA Staff at (202) 367-2342 or bisa@bisanet.org.